Date: 5-7 January, 1997 (3 nights) United Vacation "Maui and Honolulu, 5 days Budget course": 105,000 yen + 2,200 yen (US tax) / pax + 4,800 yen (one day car rental added) Schedule: 5 Jan. (Sun) : Narita - Honolulu (1900 - 0630) UA822 Honolulu - Maui (Kahului) (0830 - 0900) AQ62 Stay at Outrigger Napili Shores Resort 6 Jan. (Mon) : Stay at Outrigger Napili Shores Resort 7 Jan. (Tue) : Kahului - Honolulu (1728 - 1800) AQ113 Stay at Outrigger Waikiki Surf 8 Jan. (Wed) : Honolulu - Narita (0905 - 1300(+1)) UA821 To/From Narita Airport: Used "JR Holiday Pass" (2,000 yen) to go to the airport, where is in the valid area for the pass. Used "day time Green tickets" (valid within 150km, 3,200 yen for 4 coupons) Rental Car： United Vacation includes Hertz Car Rental. It includes LDW, and I added LIS ($10.95/day). I made it FPO, which was $23.10. Tax was $6.33 and charged $6 by state of Hawaii. Totally $68.28 I paid as an additional cost for the car. The car was Carolla, which was C class size (medium). I drove 223 miles in three days, using only two-thirds of fuel. Maybe FPO was not good. To/From Waikiki: From airport to Waikiki, by Taxi, it was $24 including tip. To airport, used bus from the hotel ($6/pax) Hotels: stayed Studio type room at Napili Shores Resort, couldn't see the sea from the room, it was $140 according to the description on the door, with full-ketchen, room size is enough, no bathtub. Napili Bay was rough and couldn't swim. The hotel has two pools. The room stayed at Outrigger Waikiki Surf was very small as the same as Japanese cheap business hotel. 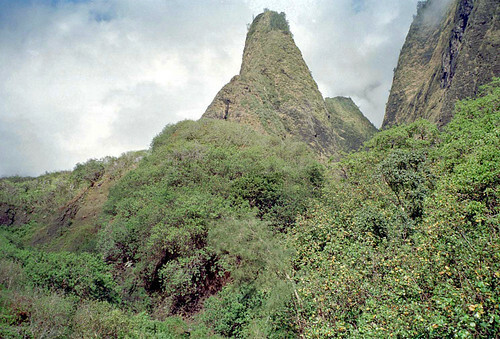 Iao Valley is quiet and comfortable with full green and river, but don't expect too much. We headed to west coast. After driving a while, the sea appeared. It was a great sea of dark blue color. We found "Scenic Point", then stopped the car to see the sea. Driving further, arrived at the town of Lahaina around 11:30. Parked at free parking lot, checked time for Whale Watching Tours. Windjammer's next tour, which has Japanese guidance, was from 2:30, but Pacific Whale Foundation was 12:00, then we decided to take it. It's $31/person. We had only 20 minutes to lunch, then took out Whopper Jr. Combo, $1.99 at near Burger King. Just before 12 o'clock, we took a boat. We had to take off our shoes on the boat. There were Japanese couple and family with two children. The boat was out to sea, it's a pretty fast, due to relatively small boat, I felt a little worse by shaking. Head was 12 o'clock, right was 3, back was 6, and left was 9. 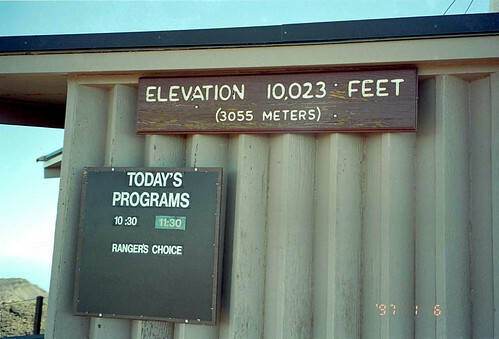 The guide on the roof cried "11:30!" when he found the whales, then all rushed to the direction of 11:30. Soon, we got to the first watching point, the boat slow down. After a while, the whales appeared at the direction 1:30. Most of the people didn't find, some were excited to see the tail of the whales. Going further to the next point, the guide said 11:30, but I couldn't find it. The whales started squirting, so I could confirm, but it's too far to take a picture. First I found squirting, then saw the tail of the whales next. Suddenly, "Right!, Right!" I heard the voice, and there were two whales near the boat! I dashed right side of the boat. They disappeared before I took the picture. But it's good to see the whales for a moment. The whales came again at the back of the boat. I took a two pictures. Later I saw the picture that I can see two part of the back of whales on the surface of the sea. Photo was not big deal, but it was certainly excitement. It's time to go back. The boat sailed so fast that I felt worse. I walked around Lahaina town, then headed to the Napili. I was very sleepy, took a nap until 6:00. The condo with a full kitchen, so we were planning to cook a meal. We went to shopping to the supermarket. Today's dinner was pasta, steak, and canned soup. We went to the Haleakala volcano today. We should wake up early because the weather became bad in the afternoon. So we got up at 6:30, made sandwich for lunch, and left from the hotel at 8:00. We enter the mountain road at 9 o'clock. Bicycles came down the opposite lane. It may be the downhill tour, which run down from the summit of Haleakala by bicycle. The tour to see the sunrise at the summit costs about $110, just downhill costs about $80. We paid $4 at the entrance gate to the National Park, then headed the summit. The ticket was valid for 7 days. On the way, going through the cloud, there is a field with rocks only, without plants. The altitude of the summit 3000m and more. At this height, a little hard to breath. Inside the hut on top of the mountain, Ranger's Talk was held. A woman talked about Haleakala. We looked at the craters of the volcano from the summit and visitor center where a little walk down from the summit. There is 21 craters, the scene was something inspiring. In the crater, the tourists are able to walk through the trail. Because of never-before-seen views of rocky, I couldn't grasp actual distance. The nearest crater seems to be very near, but actually it is quite far. I saw people walking down the trail in the crater very small like ants. Around noon, we had a lunch in the car. Outside was very cold. I wanted to go the nearest crater where is 1 mile from here. The downhill slope was steep than I thought. Going down the hill, but it takes long time to reach the crater. Crater is approaching, you can now see the plants called "Silver Sword", which is only seen here and Himalaya. Just before reaching the crater, I was said "You'll look nice view !" from a couple on way back, which excited me. I reached the crater. It is about 100m in diameter. I imagine when the magma was going out from here. After looking while, on the way back, I was aware of it was very hard to walk, because altitude is around 3000m. It was hard to breath. With shallow breathing, walking slowly, or I would fainted. It's just 3000m, so incredible climbing of Everest without oxygen. Eventually I spent two hours to walking, it was in the evening when we backed to the hotel. The dinner was as the same as yesterday, pasta and canned soup. You can get a lot of coupons at Maui. Laying on deck chairs beside the pool until 10 o'clock. Today was shopping day. We checked out at 11, went to Whalers Village, Kaanapali Resort. Shopping and Lunch here. Going Lahaina, looking at final view of the sea, then went to Kahului. After shopping at Kaafumanu shopping center, went to the airport. From Honolulu aireport to the Waikiki, we took a taxi. There was a taxi stand near international arriving. The first taxi of the queue was big limousine. While I thinking what we should do, the driver of the second car said, "Taxi?, take this" with pointing the limousine. I asked the driver of the limousine "Same price? ", then he said "It's the same. You're lucky." I got into the limousine. It's first time. To Waikiki, it takes $21. I paid $24 including tip. He said "Arigatou gozaimashita (thank you very much)" very politely. For today's dinner, we went seafood restaurant called Monterey Mall Cannery where is in the Outrigger Waikiki on the Beach to use 15% off coupon got from JCB. We had combination of top sirloin steak and mahi-mahi. It was $39 for two person. After shopping at DFS, back to the hotel. The flight next morning was 9:00. I asked where the bus for the airport. If you book in advance you can take the bus from the front of the hotel. I booked the bus at 7:00. $6/pax. It's not an airport shuttle bus, but just a big van. We arrived at the airport after 30 minutes. We had a breakfast at Burger King in the airport. The end.